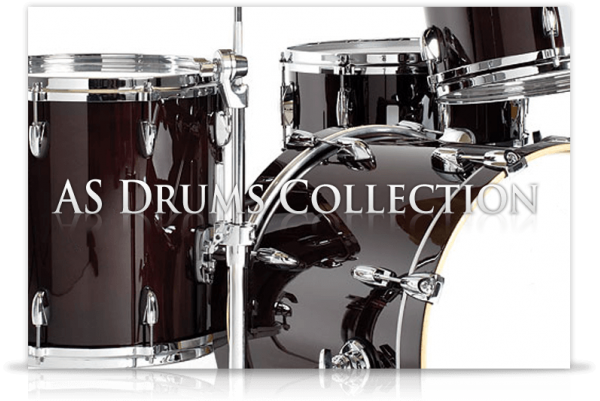 The AS Drums Collection is a bundle of 4 of our Drums instruments, you save around 40% with this bundle. The SmallDrumKits are 4 different Drum Kits (3kits plys the old DrumysM), each has two toms, a snare, a ride, a hihat and a bass drum. AS Drums Collection comes with its own sample player, the UVI Workstation 3 (requires v3.0.0 or later). 2.88Gb uncompressed, 1.4Gb compressed in lossless flac format, 2087 samples (for each version). 1.42Gb uncompressed, 709Mb compressed in lossless flac format, around 3382 samples. about 20 velocity layers X 4 round robins (so about 80 samples per drums per position) and only 6 vel layers for the two ride cymbals. kitA:149Mb (71Mb compressed) 331 samples, kitB 61Mb (33Mb compressed) 199 samples, kitC:295Mb (136Mb compressed) 288 samples, DrumysM:363Mb (208Mb compressed) 537 samples. Round Robins (4 for Kit A,C and DrumysM and 2 for Kit B). Up to 10 velocity layers depending on the kit. Detailed instruments with the most common strokes, each one is easy to play. Custom mapping, you can assign every element to any key from the interface in two different ways.You can even assign multiple elements to the same key. Custom mix, you can change the volume of each element separately. cc# controlled Hihat with different openess and automatic closing sound.